Mayo Movie World Cinema: great fun for kids and all the family with special family rates. As well as showing the most up to date movies: We screen Opera, Theatre, Concerts and Sporting Events live via Satellite to your cinema screen from around the world. Located Adjacent to Mayo Leisure Point. Take the third exit off the first roundabout and take the second left after approx 100 metres. Take the second exit from the first roundabout. Proceed to take the second exit at the second roundabout (at Cathal Duffy's Garage), and the first exit at the third roundabout ( at Mulroy's Statoil Service Station). Proceed on to take the second left after 100 metres approx. Take the second exit from the first roundabout (after Breaffy Village). Proceed to take the second exit from the second roundabout (at Mulroy's Statoil Service Station). Proceed on and take the second left after 100 metres approx. Follow signs for N5 Dublin / Westport Road. At the first roundabout (Mc Donalds) take the second exit. Proceed to take the first exit at the second roundabout and the second exit at the third roundabout ( at Cathal Duffy's Garage), and the first exit at the fourth roundabout ( at Mulroy's Statoil Service Station). Proceed to take the second left after 100 metres approx. Mayo Movie World is situated adjacent to Mayo Leisure Point, with ample FREE parking. Is it safe to use your website for online booking? Yes. We now use the Ticketnew Ltd Booking Engine and Realex Payments for online Credit Card transactions. Our implementation is PCI compliant, which means you can absolute confidence that we are using industry best practice protection measures. Various physical and electronic security measures are in place to ensure that your personal information is protected. Is my personal information kept private and secure? Yes, we’re very respectful here at Mayo Movie World about the privacy concerns of all of our customers. All the personal information given when registering/booking with us is kept on our secure servers and is never supplied or sold to any third party. However, we do sometimes need to use e-mail addresses/mobile phone numbers etc. in the event that we are required to do so, e.g. Credit Card Fraud or Garda Investigations. Can I request a ticket cancellation by e-mail? No, unfortunately we cannot cancel bookings via e-mail. If you think you’ve made a mistake with your booking or would like to cancel your tickets for whatever reason please call us on: 094 902 7777. Alternatively, you can come to the box office and we will refund your tickets for you in person. Refunds will only be allowed up to 2 hours before the show starts. There is a non-refundable booking fee in place for Internet and Telephone bookings because we offer the facility to pre-book and guarantee your tickets, a service which warrants an additional small fee. This is standard in the entertainment/leisure industry, e.g. when booking concert or theatre tickets you are charged a booking fee. The fee is detailed when the booking is requested and while you still have the opportunity to cancel your transaction. What does the film certificate mean? What different types of tickets do you offer? Child, Adult, Student (Monday – Thursday with a valid student I.D. ), Senior, Family (2 Adults & 2 Children aged 12 or under) and Kids Club. For ticket prices see above. Do I require I.D. to purchase a cinema ticket? In some cases, yes, you do. I.D. may be required for 12A, 15A, and especially 16 & 18 certificate films. A valid Third Level Student I.D. is required when purchasing student tickets. If there is a dispute, the cinema managerial decision is final. How long before my movie do I need to give notice if I wish to cancel my tickets? Due to the nature of our business we can only offer refunds/ticket cancellations up to 2 hours before the show start. No correspondence will be entered into as this is standard in all cinemas. At the end of your booking you will be given a unique reference number. Please make a note of this number and keep it safe, as you will need to bring it along with your card when you collect your tickets at the cinema. Where can I collect my tickets? You can collect your tickets at any of the tills or from the Automated Ticket Machine using your credit card/reference number. If your booking contains a student ticket, you will only be able to collect your tickets from the box office as you will need to present a valid student I.D. I’m only 13, why do I have to pay an adult price? Customers who are aged thirteen and over are classified as adults for the purposes of the mandatory conditions on the exhibition of films relating to the protection of children from harm as contained in the Licensing Act 2003. Can I bring a baby into a film? Do I have to pay for them? We try to accommodate babies in our cinema as best we can although age restrictions do apply – babies will only be admitted into films with a G, PG or 12A certificate. We ask that you please respect all other customers enjoyment of the film and if your baby becomes distressed we ask that you leave the screen until they are settled, or we may have to ask you to leave. There is no charge for a baby in your arms, however if your child needs to take up a seat you will be asked to pay a child’s price. 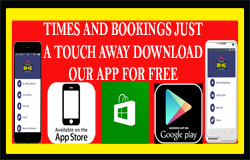 Download our App for free and and just be a touch away from finding out what time that movie you want to see is on at or if you want to see what the new releases are this week or book tickets for any movie or event. *Please note: There is a charge of €1.00 for 3D glasses which, once purchased are yours to keep and re-use for future 3D movies. This website and its owners take a proactive approach to user privacy and ensure the necessary steps are taken to protect the privacy of its users throughout their visiting experience. This website complies with all UK and Ireland’s national laws and requirements for user privacy. Cookies are small files saved to the computer’s hard drive that track, save and store information about the interactions and usage of the website. This allows the website, through its server to provide the users with a tailored experience within this website. Subscriptions are taken in compliance with UK Law detailed in the Privacy and Electronic Communications Regulations 2003. All personal details relating to subscriptions are held securely and in accordance with the Data Protection Act 1998. No personal details are passed on to third parties nor shared with companies / people outside of the company that operates this website. Under the Data Protection Act 1998 you may request a copy of personal information held about you by this website email newsletter program. A small fee will be payable. If you would like a copy of the information held on you please write to the business address at the bottom of this policy. In compliance with UK Law and the Privacy and Electronic Communications Regulations 2003 subscribers are given the opportunity to unsubscribe at any time through an automated system. This process is detailed at the footer of each email campaign. If an automated un-subscription system is unavailable clear instructions on how to un-subscribe will by detailed instead.